Posted on February 4, 2019 by Eric Bonnici wrote in Festival News. It has 0 Comment. Organizers of LiUNA! 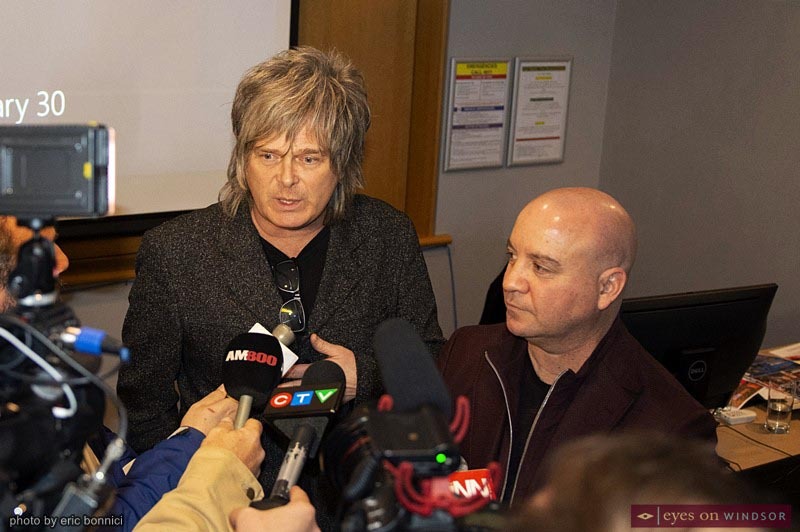 Bluesfest Windsor revealed their full lineup for the 2019 edition of the festival last Wednesday (Jan. 30) during a press conference, with an exciting new format which includes four nights over two weekends of specially themed concerts. Over the past few years Bluesfest Windsor has been evolving and diversifying to bring more than just Blues acts to the festival. This offers a wide range of music for a wide range of fans. While the festival is no longer purely Blues, drawing criticisms about keeping the festival name the same from some Blues purists, one thing is certain, the format is working and drawing record crowds. Bluesfest Windsor has become the biggest, most attended, and most popular music festival in the region. As the festival continues to evolve, perhaps keeping the name is a great legacy and tribute to where the festival got its roots! 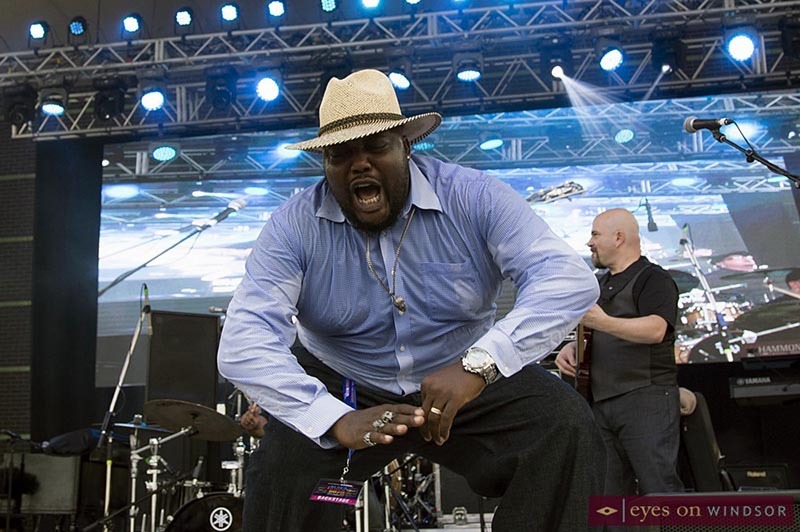 Sugaray Rayford performing at Bluesfest Windsor at Riverfront Festival Plaza on Saturday, July 14, 2018. Photo by Eric Bonnici / Eyes On Windsor. In the past Bluesfest Windsor ran for one weekend for either 3 days, or as in the past few years, four days. This year the festival will run on back to back weekends on the Friday and Saturday for four nights of music. In the future the festival plans to expand to more days than that. 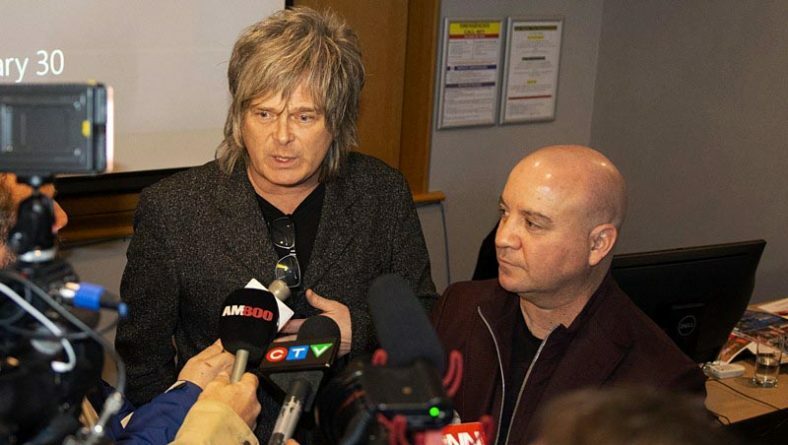 “As you know we’ve got a little bit of a different format this year which is striving towards our goal of a ten day festival, we have secured four nights,” stated Rob Petroni, festival President and Business Manager of LiUNA! 625. Last year’s 90’s Throwback themed night was a huge success completely selling out the Sunday, a day which was typically the least attended day of the festival. So this year the festival is holding four themed nights. The four special nights of concerts are themed as follows: 90’s Throwback, Hot Rock Night, A Night for Amazing Blues, and a Celebration of Prince, featuring legendary performers and rising stars coming. Bluestowne, a special area located in Windsor’s Riverfront Festival Plaza featuring a second stage, food vendors, and beverages all under a giant tent, was added to the festival in 2017. Last year it was doubled in size and it will be back for 2019. Acts lined up for the Bluestowne stage will perform between main stage sets. Blues Rocker, South River Slim, performing in Bluestowne at Bluesfest Windsor on July, Fri. 13, 2019. Photo by Eric Bonnici / Eyes On Windsor. On Friday, July 5, Bluesfest Windsor 2019 will kick off with the return of their 2018 sold-out show an all new 90’s Throwback featuring Vanilla Ice, Young MC, Rob Base, C and C Music Factory ft. Freedom Williams plus (new this year) Tone Loc and The 2 Live Crew. In 2018 Bluesfest Windsor mixed in some rock and rap along with blues into their entertainment line up and it was nothing but a big party when Vanilla Ice took the stage on Sunday night, July 15, 2018. The Sunday completely sold out and Windsor’s riverfront was packed. 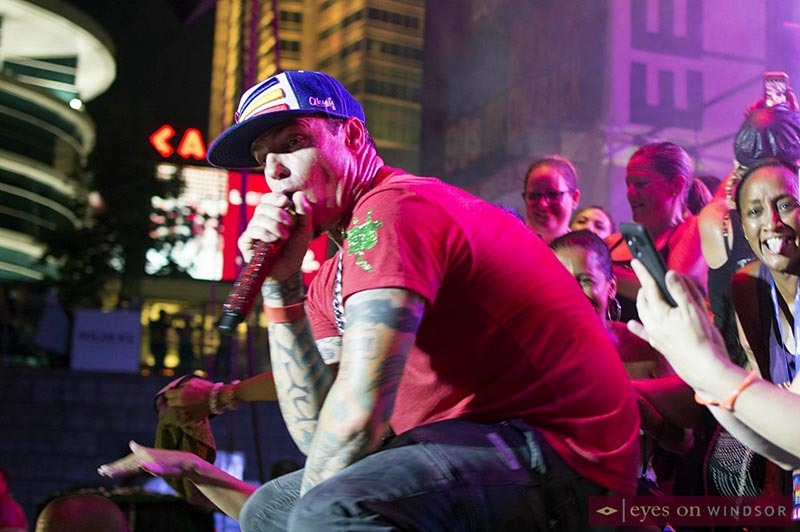 The crowd loved Vanilla Ice and he even brought a bunch of fans right onto the stage with him to party! And what a party it was! Vanilla Ice brought fans from the crowd to party with him on stage as he performed during the 90’s Throwback Concert, part of Bluesfest Windsor, at Riverfront Festival Plaza, on Sunday, July 15, 2018. Photo by Eric Bonnici / Eyes On Windsor. On Saturday, July 6, Bluesfest Windsor 2019 will be themed Hot Rock Night featuring world-class rockers X Ambassadors from Ithaca, NY. Their bombastic sounds and hit songs have garnered multi-music awards across the continent including a gold-certified album for VHS and double-platinum hits like Renegades and Unsteady as they continue to win fans and sell out concerts worldwide. Performing on the Bluestowne Stage are Greatest Hits Live. For a decade, electrifying local band, Greatest Hits Live have mastered the art of reproducing the greatest rock music of our time with incredible tribute shows, including the Best of Styx and Journey, Best of Canadian Rock, Best of 70s Rock, Best of 80s Rock, and The Ultimate Classic Rock Show, are renowned! 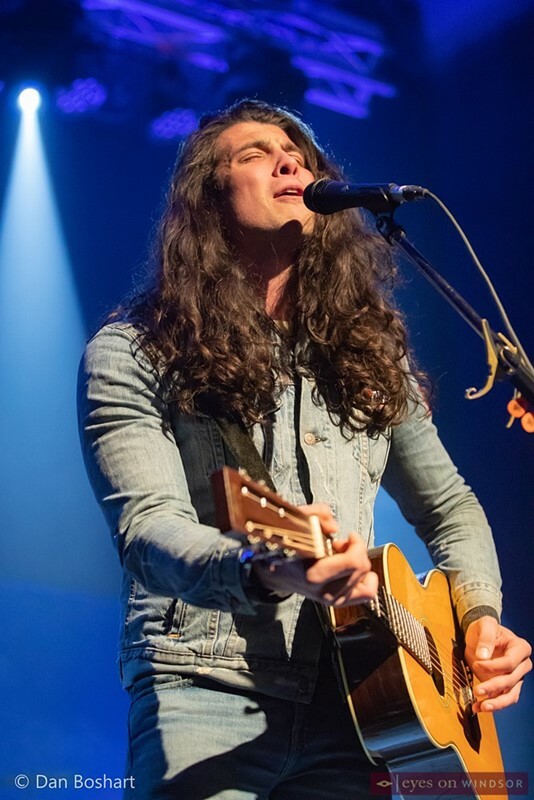 Rising Canadian rock star, Billy Raffoul performing during Jody Raffoul’s album release show at The Bank Theatre in Leamington on Fri. Nov. 30, 2018. Photo by Dan Boshart / Eyes On Windsor. Blues purists, aficionados and genre newbies won’t want to miss the legendary blues icon Buddy Guy performing his classic hits and new tunes from his18th solo LP and latest album, The Blues is Alive and Well. At 82 years young and a touring schedule akin to a rising star, with seven Grammys and countless music awards, Bluesfest’s special night with Buddy Guy will simply amaze! Buddy Guy unleashes an intense series of guitar riffs during a performance at Caesars Windsor on Wednesday, October 3, 2018. Photo by Kevin Blondin / Eyes On Windsor. Performing on the Bluestowne Stage are incredible Blues performers Scott Holt and Hurricane Ruth. Scott Holt electrified fans right here in Windsor Essex when he headlined Bluesfest back in 2011 and 2015. Holt is also an inductee of the Canada South Blues Museum Hall of Fame located right here in Windsor. 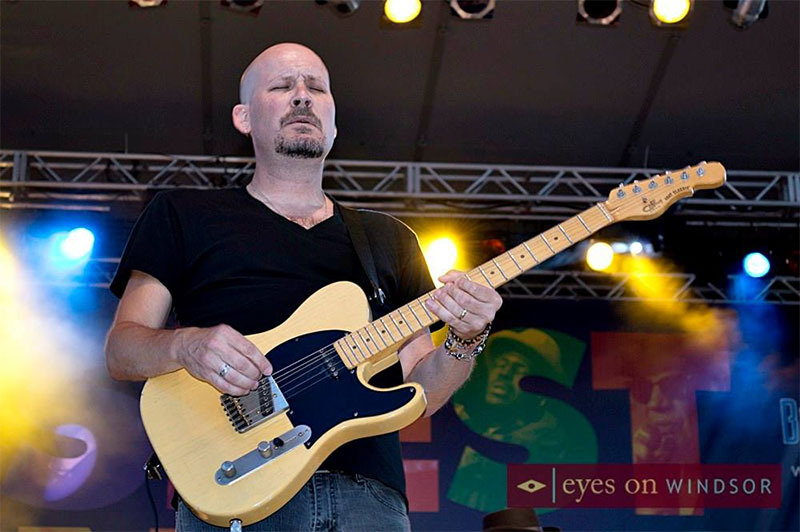 Scott has been a bearer of the Blues torch for his entire career. Born and raised in Tennessee, Texas and Mississippi, Scott began his musical journey relatively late. 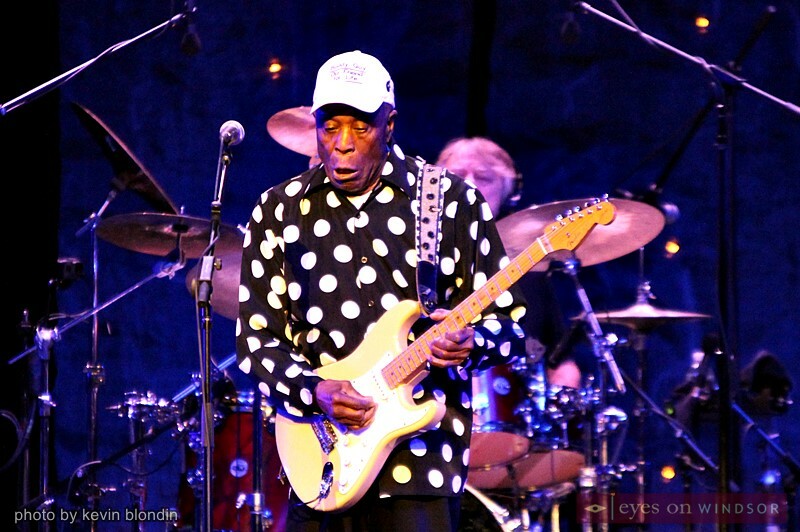 At 19 years old Holt jumped on the fast-track joining his friend and mentor Buddy Guy, playing guitar for 10 years during the most successful period of the Legend’s career. Holt has established himself as a six-string powerhouse and a penetrating and soulful storyteller. Through the countless miles criss-crossing North America, Scott developed a reputation as one of the most exciting live acts in the world. Electrifying Blues guitarist Scott Holt performing during Bluesfest Windsor on Sunday, July 12, 2015. Photo by Eric Bonnici / Eyes On Windsor. On Saturday, July 13, Bluesfest Windsor 2019 will feature a Celebration of Prince. This very special night is a tribute to the award winning, flamboyant 1980’s music icon, singer, songwriter, musician, record producer, actor, filmmaker, and the one and only “Purple One”, PRINCE! 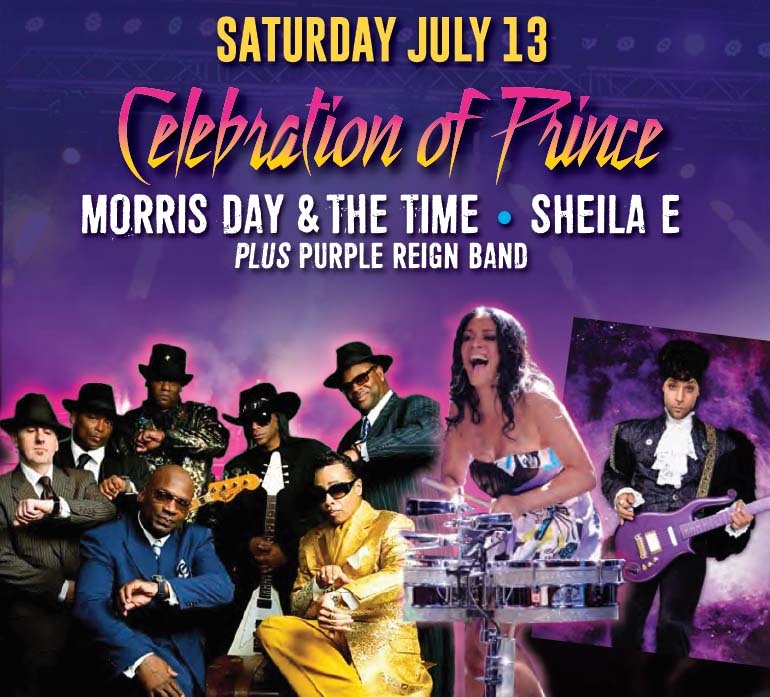 The exciting lineup features Morris Day & The Time, Sheila E., award winning Prince tribute show Purple Reign, and Detroit’s legendary blues and R&B artists Kathleen Murray and The Groove Council. South River Slim will thrill the crowd on the Bluestowne Stage. Celebration of Prince Bluesfest Windsor promotional poster. Morris Day, Master of Cool, with his smooth vocals and dynamic dancing was a high-school classmate of Prince and also a founding member and performer in his band, The Time. Going solo in 1984, today, Morris Day & The Time perform hit songs like Jungle Love to standing-room-only crowds across the country. Sheila E. is a world-class percussionist, singer/songwriter, author and humanitarian. Her trailblazing career, still without bounds, began in the mid-’80’s when she became the biggest and brightest of Prince’s protégés. Her fierce, dynamic energy onstage has made her a major concert draw since the ‘90’s, captivating audiences around the world with a variety of styles from Latin, and jazz, to R&B and pop. With groundbreaking hits like The Glamorous Life and A Love Bizarre, plus career credits that include the likes of Ringo Starr and Diana Ross, Sheila E. will create a new dimension of entertainment for Bluesfest fans. Purple Reign is an award-winning live show produced by and starring Jason Tenner. Playing the Las Vegas strip for almost two decades,Tenner’s funk, neo-soul, pop and rock sound, plus his Prince-like persona has been a hit sensation with audiences from around the world and has led to a guest musical appearance on the David Letterman show. 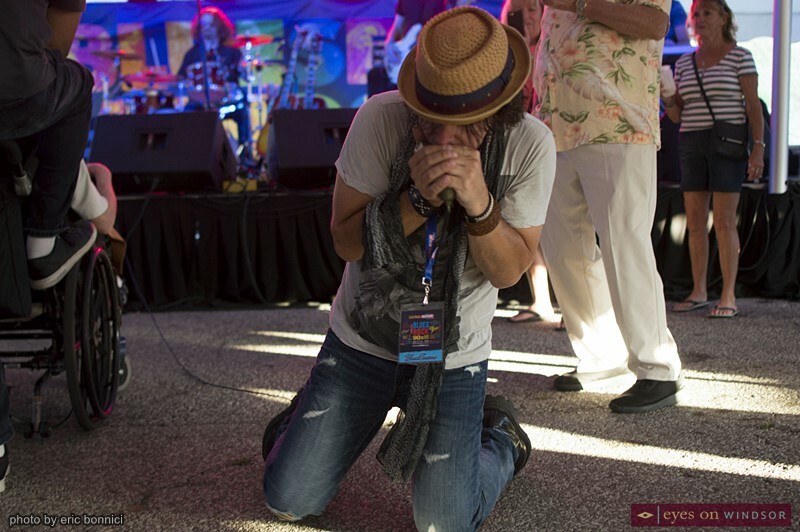 Energetic local Blues Rocker South River Slim will return to the Bluestowne Stage for the third year in a row. Eyes On Windsor interviewed Slim last month and while he would blow the crowd away on the main stage he told us he prefers the Bluestowne stage because he can be more intimate and interactive with his audience. 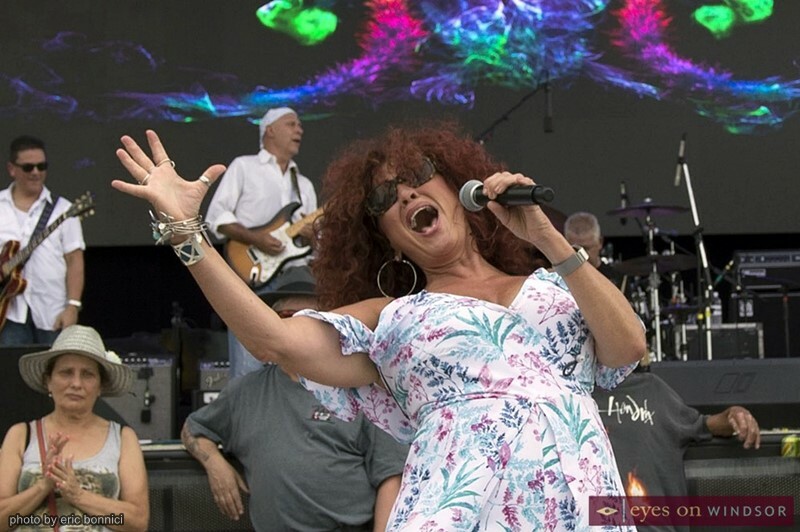 Detroit’s legendary blues and R&B artists Kathleen Murray and The Groove Council performing during Bluesfest Windsor on Sat. July 14, 2018. Photo by Eric Bonnici / Eyes On Windsor.